Here’s how UNLV’s units did against Air Force at home on Saturday. 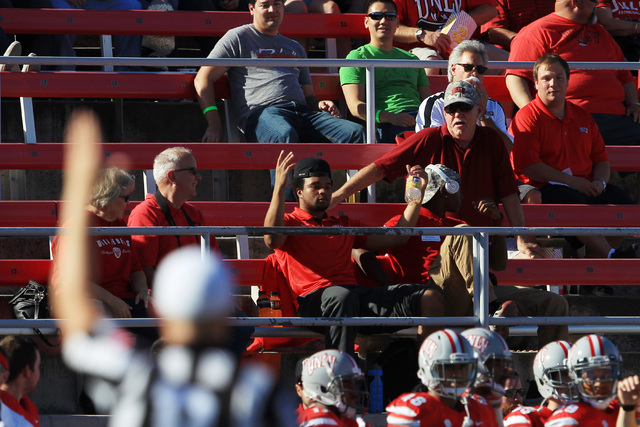 If there was a bright spot to a dismal performance by UNLV on Saturday, it would have to be the offense. Bright spot is probably quite a stretch, though. While Blake Decker completed 18 of 32 passes for 263 yards and a score, he was also sacked five times. Those hits eventually resulted in an injury to the starting quarterback. Freshman Jared Lebowitz entered the game and struggled mightily. He finished 3-for-12 for just 18 yards. Several of his throws sailed high, giving open receivers no chance to even try to make a play on the ball. The return of Devante Davis bolstered the unit somewhat. The senior receiver caught six passes for 114 yards, including a second-quarter touchdown. Devonte Boyd also continued his strong play with seven catches for 81 yards. The numbers don’t look terrible, but the offense just couldn’t do enough to help out the overworked defense that was on the field for more than 37 minutes. The rushing attack was nearly nonexistent. UNLV ran the ball 30 times for just 33 yards. That’s not good. UNLV just saw an option team last week. It didn’t look like it. The Rebels struggled to maintain discipline and Air Force had its way all day, racking up 386 yards on the ground. Granted, the AIr Force attack is far different from the one the Rebels saw against New Mexico last week. That’s no excuse to perform like the system is something they had never even seen on film, though. There were also numerous breakdowns in the secondary. This is a tricky one because it can be very frustrating for defensive backs to continue to cover receivers all day when the opponent is very rarely even threatening to throw the ball. That’s part of the beauty of Air Force, though. They will do nothing in the passing game all day and then try to go for a big play out of nowhere. It’s on the defense to continue to play every play like that might be the one, but UNLV failed in that regard. The Air Force quarterbacks combined to complete 7 of 8 passes for 156 yards. That’s what happens when your receivers are wide open. There wasn’t a whole lot to judge on here. Air Force did average nearly 10 yards more per kickoff return than the Rebels. UNLV deserves some credit for a fake punt play that seemed doomed from the start, only to result in a big play and a first down. The real downgrade here comes because of a brutal 13-yard punt in the first quarter that may have been a big momentum changer. UNLV led 7-3 at the time. Logan Yunker shanked a kick that went out of bounds almost immediately. The Falcons got to start on their own 38-yard line and the drive resulted in a touchdown that gave Air Force a lead it would never relinquish. UNLV never looked prepared to play on Saturday. After a solid opening drive on offense, it all went downhill. The Rebels defended the option like it was a foreign system they had never so much as heard of, much less viewed any film on. Again, UNLV had just seen a somewhat similar system just a week ago. There was no excuse for the lack of preparation. To his credit, Hauck accepted responsibility. “We are just not playing good enough to win right now and that’s on me,” he said. That’s at least the first step to fixing the problem. It’s pretty late in the season, though. UNLV is now 2-8 and will need to find reasons to be motivated as the disappointing season wears down. The Rebels looked like a team that can’t wait until those games are over.